Illustrations for the next issue of Delayed Gratification. These are illustrating a story by Jeff Campagna of the newly elected Panama President's campaign against Gangs. Taking a very different approach to most, with a new initiative giving amnesty to gang members, weekly allowances and job training which helps integrate them back into law abiding society. However, after ten weeks since announcing the new deal, the programme had officially ran out of money. With more and more gangs coming forward to claim their places on the tapped out programme, frustration and violence erupted in the streets worse than ever. With this in mind, the first illustration shows a smoking gun with the smoke in the shape of Panama. The second illustration has guns being handed up and money passed down in exchange. 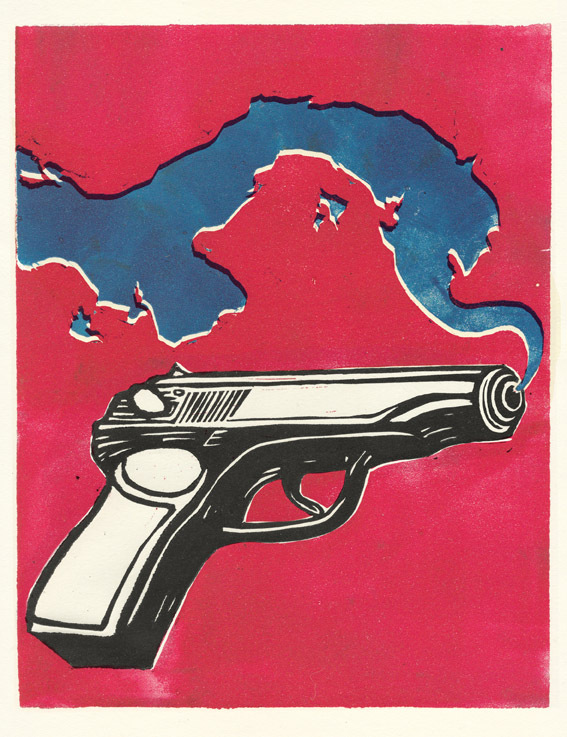 The spot illustration shows the flag of Panama being used as a target for gun fire.